Here's a quick forum set tutorial for Gimp. 1. Open new image- size 600 x 250.
element 54- use the rectangle select to frame this element, then click the eye in the paper 10 layer previously hidden. Go to SELECT>INVERT and EDIT>CLEAR to make the paper appear behind this element only. 3. Add your tube of choice. 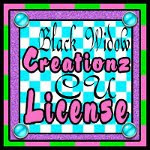 Include copyright symbol, artist's name, website and license number if applicable. 4. Add drop shadows to the tube and other elements as you like by going to FILTERS>LIGHT & SHADOW>DROP SHADOW.